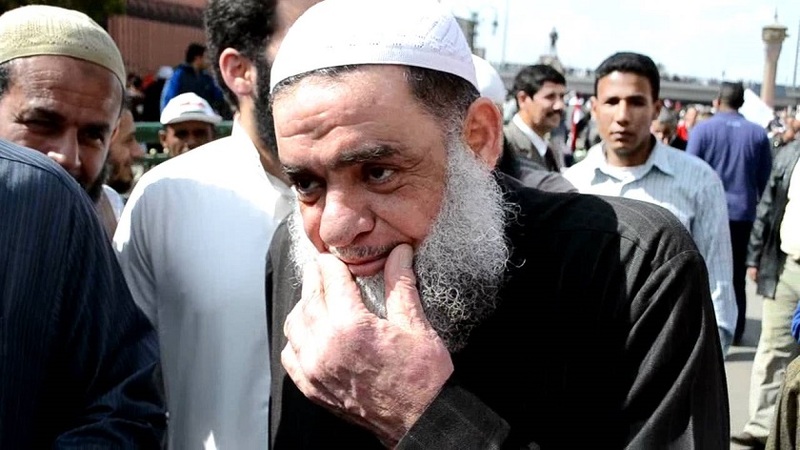 Mohamed Abdel Maksoud, a Salafi signatory of Egypt Call. 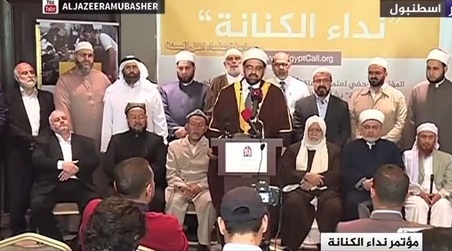 Samuel Tadros of Hudson Institute in Washington DC told Lapido that ‘Egypt Call’, a 13-point document published last week by 159 Muslim scholars from 35 nations, and endorsed by the Brotherhood, provided ‘Islamic justification’ for the fight against Sisi. As President Sisi visited Germany and secured an eight-billion-Euro energy deal, two policemen were shot dead near the Giza pyramids. Meanwhile, the Muslim Brotherhood sponsored protests in Berlin. ‘Tell Merkel to stand up for democracy and human rights in Egypt,’ tweeted Ikhwanweb, their official English account. Both activities find justification in the new document which reinforces already grave questions about whether the Muslim Brotherhood is behind violence in Egypt. Points 11 and 12 recognize the international struggle, condemning nations that have stood with Sisi, while praising governments, politicians, human rights organizations, and others who have criticized him. Point 13 specifically mentions civil disobedience. Press conference in Istanbul for Egypt Call. Ghoneim (mentioned below) is back row, 5th from left. The sharia views them as killers, it says, and they deserve the judgment of those who kill. But the text also insists – without specificity – that this must be according to legitimate methods. Jihad as a concept can be viewed along a spectrum from the struggle to submit to God, to the fight to submit the world to him. It has issued statements that condemn ongoing violence, but also praised previous Brotherhood militancy. For Tadros, the ambiguity is now gone. He sees in Egypt Call the concept of ‘loyalty and disavowal’, often interpreted in the modern world by jihadis as the rejection of all who do not fit their definitions of sharia. The doctrine requires viewing those disavowed as non-Muslims, or unbelievers. Tadros recognizes, however, that the word ‘unbeliever’ is not found in Egypt Call. Rather, in detailing how the Sisi regime has fought against Islam, allied with enemy Zionism, and killed and imprisoned thousands of innocents, it lets readers make this judgment for themselves. Over 500,000 have indicated their support on the official website. According to Joas Wagemakers, a prolific writer on political Islam and lecturer at Radboud University in the Netherlands, ‘loyalty and disavowal’ has some Quranic inference. But it was developed by the early Kharijite movement that rebelled against the caliphate. Wagemakers, in his chapter in editor Roel Maijer’s Global Salafism, says Sunni Islam rejected the concept until ibn Taymiyya resurrected it in the fourteenth century. Modern-day extremists use it to justify rebellion against a Muslim ruler. Point 2 of Egypt Call references one of the principle Quranic verses underpinning the doctrine. But it does not specifically use the terminology, nor label the regime as non-Muslim. Tadros attributes this to internal philosophical disputes on technical points about legitimate rebellion. But these religious scholars, he says, do not see themselves as offering points on strategy. According to the research of Michael Cook, a professor at Princeton University and author of Forbidding Wrong in Islam, majority scholarly Sunni opinion is against the idea of opposing even an oppressive ruler. Most say it will result in more harm than good, even if legitimate. But the heritage of sharia includes voices which advocate a quiet rebuke, and others who advocate outright militancy. Where does the Brotherhood fall? Some ask whether retribution is to come from formal judicial tribunals after they restore Morsi. A recent report from the semi-governmental National Council for Human Rights said 1,250 Muslim Brotherhood members had been killed in the eighteen months after Morsi’s overthrow. Others question whether they have advocated the kind of assassinations seen at Giza. The same report said seven hundred security forces had been killed during the same time period. Egypt Call does not provide details, but a brief look at the signatories offers perspective. Tadros has identified several of them from previous research he did into Egyptian Islamism. While in Germany the Brotherhood tweeted about democracy and human rights, one of the signatories Said Abdel Azeem, an Egyptian Salafi leader denounced democracy on YouTube as ‘an idol that people worship apart from God,’ and said that it permits all sorts of excess in personal freedoms. The film has received more than 28,000 views. Azeem has taken a stand against jihadis who kill Muslims they deem apostates, but another signatory, Atiya Adlan, adheres to the Sorouri strand of Salafism that adopts the concept of ‘loyalty and disavowal’, declaring the ruler who does not govern by sharia to be an unbeliever. And signatory Mohamed Abdel Maksoud, a pro-Brotherhood Salafi leader, has previously hailed the jihad of Osama bin Laden. More acutely applicable to the Egyptian struggle, he called for the killing of Syrian President Bashar al-Assad, and praised the vengeance taken against Egyptian police. Though not a signatory, Wagdy Ghoneim spoke at the press conference in Turkey that introduced Egypt Call. Ghoneim has called for the killing of pro-Sisi journalists. When the Islamic State beheaded Copts in Libya, whom he called ‘Crusaders’, Ghoneim had no condemnation but launched a diatribe against the Coptic Church. At a popular level, the official Facebook page of the Brotherhood’s political party in Maadi, Cairo, shared video of ‘revolutionaries’ firebombing an empty train. None of this is proof that the Brotherhood is behind the violence in Egypt. But it chips further away at the veneer of ambiguity, even as they cling to it. The editor-in-chief of the Muslim Brotherhood’s official English website did not respond to a request for clarification.